All parts came perfect out of my 3d printer. But the dimensions for universal tool mount (connection to conduit) do not look right. After screwing this to the z axis the complete assy is bent (x/y # 90°). You can see that the connections points are not aligned to the conduit. Is this realy the 25mm Version. I checked all Dimension in the model and on the real Part......there is no deviation. Hi, post some pictures in the forums and we can help you out. for which parts it's needed to print with support or adhesion ? No supports, please see the parts pages for printing details. Is this a design decision? If yes, what for? Thank you very much for sharing your design i have built mine after printing all my parts on the Tech2c printer. Its brilliant! Just learning how to use but have had some amazing results already. Are the design files (openscad) also available ? No, sorry. Please see the FAQ's on the site for more detailed answers. Hello and thank you for this great milling machine. I printed and then mounted the milling machine, but I have a problem. In the tutorial it is shown that the bars of the center must make a 45 ° angle and this is not the case of my bars of the blow, the milling machine forces more than one dimension than the other when it advances. I printed my PLA coins to avoid warping. One of my rooms may not be right? Bonjours et merci pour cette fraiseuse géniale. J'ai imprimé puis monter la fraiseuse, mais j'ai un problème. Dans le tuto on montre que les barre du centre doivent faire un angle de 45° et ce n'est pas le cas de mes barres du coup, la fraiseuse force plus d'un coter que de l'autre quand elle avance. J’ai imprimé mes pièces en PLA pour éviter le warping. Une de mes pièces pourrez ne pas être droite ? Hi, It is best to use the forums for help please. Здравствуйте! очень благодарен за этот проэкт, но вот у меня подошел моент сборки и я упираюсь в проблему с электроникой, я просто еще незнаю, только учусь, как настроить прошивку а базе мега 2560 с рапс 1.4, не могли бы вы мне помочь с прошивкой, я немного начал разбираться с прошивкой марлин. если у вас есть прошивка марлин под плату MEGA 2560, поделитесь пожалста со мной. заранее огромное спасибо. I do it is on the website wit the rest of the firmware. if you want more help ask you questions in the site forums please. That's really neat, I'm taking inspiration on a project similar. Thanks for sharing. Just an FYI, I use this company for bits of bespoke steel - https://www.avocetsteel.co.uk - customer service is great and they will always try and help with what you need. I do like how, for the smaller sized machine the woven keeps things small. In comparing the build list on V1engineering to the part list for the 25mm OD on thingiverse, I see discrepancies with some part nomenclatures. I also see the Pineapple Coupler listed twice in the file list but once on your site. Any insight would be helpful. Due any of the parts require supports or a specific orientation. I am assuming that the current orientation is the recommended print profile, just want to make sure. Take a little closer look at the first paragraph on the parts page and almost all of those questions are answered if not the instructions clear it up as well. If you want more info please use the forums. Depends on what side you care about the most. Upcut or downcut, single flute. Please, questions are best to ask in the forums. Love the design, preparing to build one! Just a question about the pipes.. I'm building a small machine, 400x400 cutting surface, so pipes would be 660mm long.. Would it be a problem, weight wise, to use 2mm wall thickness, or do they have to be as thin as possible? Please ask questions in the forums, TV is slow to work with. Thickness isn't a huge deal. Thanks for all your hard work designing this cnc, i have to say that Middle Assembly is a work of insane genius, i could not stop looking at it trying to think how you came about thinking of this design. it is a work of art. I printed most with with 0.8mm nozzle 40 infill gives much stronger prints, on my cheap anet a2 3d printer in pla hopefully it will last awhile. Glad you like it, thanks for letting me know. Makes my day pretty awesome to hear this kinda stuff. I have been printing with some thicker layers as well. Loving it. Have a look at the site, I do not sell the tubes. Oooohhhhh, I get it. I did. I found some stainless steel stain. Hi, I will use 25.4 steel tubes. how many meters I need to build a cnc like the main picture, and, what is the print area for this configuration?. Thanks. All the info you need is on the site linked in the description. Thanks!. This can works with a cheap electronics kit (arduino 2560 + ramps ) 30$? Or needs a RAMBo board?. There are two pages on the site with pre-made firmware for pretty much every board. Please ask questions over there in the forums. Genial, gracias por compartir, intentare hacerlo con tubos de aluminio, saludos. gracias por la respuesta, el aluminio tiene 1.3 mm de grosor, si no me funciona lo cambiare, muchas gracias por haberlo diseñado para varios tamaños de OD tubos. Awesome buddy, so glad to hear it. Thanks for trying it out! PVC is not an option. The vicious1.com forums is much better place for questions. Hi, my MPCNC is almost finished. It works great, but I have to turn on or turn off my DW660 manually, because I can't figure out how to connect DW660 to Ramps 1.4 electronically. Can you kindly give me a hand? Thanks so much again for your help in advance. Most of use do it by hand. A few use an ssr. More info in the forums. Thanks for your quick reply. Got it. Five up! I'm looking for the plain F-XYZ model. I don't want to use the T8 bar. Can you post the old file somewhere? Thanks a lot dude, very good project. Still works either way, same parts. I ship the kits with both the new parts and both nutlocks, means it will work 3 different ways. Could anyone send the files in Parasolid or Step format? I would like to modify the cross beams to a dual system to make it more rigid when building a larger version so need to modify some of the parts. can anyone give me an advise? i had printed almost 90% of the parts needed and I did not continue finishing it from mid 2016 until now and today i saw many modifications made on the model. do i need to continue printing on the last version or print the new version. Not all of the new and old parts fit together. I think you should jump in the forums and post some pics of what you have. I do think the new parts are much better but depends on what you have left to print. Has anybody been able to cut 3mm aluminium sheet or any thickness aluminium with this design? Yup. Someone just put up a video cutting aluminum at a 4mm DOC. Thats better than my last aluminum vid. Info in the gallery and forums on the site. What wall thickness is the best to use? 1.5mm will be anough? or 3mm will be better. I want to use steel pipes. Maybe alluminium ones are better? No aluminum. You can search the forums for this topic it comes up all the time.  Hello, this project is great, this engine works or not. Where are the M3.5 screws used? I cannot get M3.5 anywhere, seems such an odd size. sure, m3 or m4. you will have to do a little work to make them fit but it comes up in the forums all the time. Hi Allted, i plan to build one. Anyway, I notice on most cnc shield there is only 3 stepper motor output, one for each axis (xyz). Meanwhile you apply 2 stepper on x-axis & also on y-axis. How to manage this ? May I need to parallel the output wiringt so it feed 2 motor ? Thank you. You can either wire them in parallel, or we have recently moved to series. The wiring kit I sell should work with any board and is now in series. Thanks Allted, I've visited your web above. As I can learn if I using 2 motors in paralel using drv8825 with max current 2.2A, so I should use step motor rating 2.2A / 2 = 1.1A or below. Is it correct Allted ? Next question Allted, If I apply series wiring - if I not misteke -so the current is not doubled - but the voltage should be doubled, so total power is the same. So How the methode for setting Motor current limit, is still the same as to set single motor (Current Limit = 2xVref) ? Series is the same as a single stepper, parallel is double but do not exceed. 0.7V on the 8825 without active cooling and anything above 1v gets super sketchy. Got it Allted, Thank you. Hi, I believe most people are using a RAMPS or similar 3D printer style board rather than a CNC shield. It is ok too if using Ramps. I just think when I use ramps then many features are useless (heaters, thermistors, extruders motor drvs, cooling fan) and surely more expensive. I understand Allted uses ramps to prepare the cnc milling so it can be upgraded to 3d printer. But I plan to dedicated it as cnc milling only - so I think better for me to use cnc shield. Most other boards use a different firmware, so you will have to adapt all the things we do to suit your build. Only do this if you understand the differences. Ramps is just about as inexpensive as it gets. I copy that Allted. Other side is I want to try another thing available. Looks like I want to try grbl firmware. Many thanks for your help Allted. Yes you can use ABS as the site links but do note ABS shrinks a bit.. so PLA is recommended for dimensional accuracy! for 25mm tube and nema 23 motors? can you upload these parts. I'm sorry but it is an extraordinary amount of work to do that, and the weight can be detrimental on your accelerations. V8 in a VW bug? ok....but it's free, and they are 5 little nema 23 motors! scuse me for my "nice english"
Sell or trade them for some 17's. 23 need a different control board. This has come up more times than I can count. Have a look through the forums. i find the part for nema 23 motors, thank you so much. Excellent work, I've got a suggestion though, the part IE_Foot_Bottom has a weakness at the point where the bolt tightens the part around the steel bar, and it tends to crack there. If it had a longer bolt, and protrusions rather than cutouts for the bolt to tighten against, it would be much more durable. That part has never been updated it is the original foot. I have big plans for the feet but never seem to get to them. Mine fit very snug even without a screw. I usually barely even snug that at all. That's fine if all your legs are exactly the right height, but it's difficult to cut steel tube accurately without good equipment. Good clamping is important for me as I'm using the foot clamps to adjust the leg heights and make all four corners level. Perhaps this wasn't their purpose. Anyway a possible workaround is to print a custom shim to go under each steel leg, inside the foot, to correct the height. Hi! I've finished my mpcnc and it's great! The Z rod screeches a lot and gets stuck many times. How can I resolve this? Would lubricating it only be enough? Even though I've used the "standard" firmware for mpcnc when I try to calibrate making eg a 100mm square, I'm having systematic errors having a square of 98x98mm. A better place to ask questions is the forums. I am the only one that gets notified about comments. Yes, you absolutely need to lubricate the z axis, metal on metal. Sounds like you might have not used 16 tooth pulleys. If this does not solve your problem please use the forum and answer the questions in the sticky. I'll lubricate the rod and hope it solves the main problem. The pulleys I've bought are 16 tooths. I'll check the forums, thanks. Is it possible to mention the minimum bed size to print the whole MPCNC ? Just drop the part in your slicer and see if it fits. Biggest footprint is the xyz, or the xy pieces. Rotate these around and they fit on most printers. hello. thanks for this interesting machine, i wanted to ask is it possible to run it with gt2560 board? Hi, Thanks again for making this machine possible for us. I'm printing "5/25/16" parts and sadly missed the rollers update (7/13/16 – New Rollers). I've printed 4x Roller_Motor_Mount (last update: 4-25-16), 4x IE_roller_lock_25 (9-12-15) and 2x IE_Roller_F_25 (4-26-15) with 2 left to print. Are the new rollers worth ditching the roller parts that I've printed or do you think I'll do fine with the old version? My machine is to become a dedicated 60 x 60 x 1 cm (maybe more on Z) working volume PLA printer (so I guess not so much rigidity is needed as for a router). I would really like to hear your take on it - would you reprint? Any chance of mixing: 5-25-16 rollers on one axis and 7-13-16 on another? To save me some printing, or would that mess up the gantry geometry/leveling? You can't mix and match them. The new ones are better but it is totally up to you. It just isn't a huge difference. If you have time make the new stuff. If you are getting antsy use the old parts. Besides, congratulations for the work, I only needed to print these two pieces that I was in doubt. Lots of info on the assembly pages about all of this. Use the nutlock that fits your coupling nut. The time is doubled because I ship both with the kits and this is how I calculate price. Pinapple coupler, all the info is on the assembly page again. Use the one that fits, are you using a 5/16 rod or an 8mm? If you are in doubt print them all and use the one that fits it will only cost you an hour and $.20 worth of filament. I am struggling printing the XYZ .stl. It looks like it makes the perimeters inside the infill. It just happens on the right side of the piece. Thoughts? Gcode is made with Cura. Hi! Great design:) Can I use M3 or M4 instead of the M3.5? Having a hard time locating them in Norway. If you find M3.5 in europe, please inform us, thanks. Are you doing it in ABS or PLA? I'm thinking of doing in PLA, because it's easier to print, I wanted to know if anyone had bad experience, after they had done it. Hello! I'd like to know if there are limits to the min dimension of this kind of CNC, I need a working base of an A4 (around 21cmx30cm), do you think it could be a problem? That is a great size should work out really well. I've solved that problem of "miscalibration" of the printer, but in the end I found it was just the fillament's color problem. Originally I tried to print in red and then I tried black and white and they fit perfectly on the tubes. Anyway I'm writing to you to ask in the part's table the "Nut Lock" how many copies should I make? In the QTY you've got only 1 piece but in the total time you've got the double of the "Time/part". So what is it really, one or two pieces? You need a spacer and 1 of the two locks. Do you have the files in anything other than STL format? Fusion 360 files would be ideal for me as I want to machine some of the parts in Aluminium and if I can import them into Fusion 360, I can quite easily use the CAD mode to define the machining paths. No sorry, I have an explanation in here, http://www.vicious1.com/frequently-asked-questions/. I've started this project by printing the IE_Foot_Bottom.stl file from this 25mm OD version and when I've measured with a caliper it measured at maximum 24mm. I intended obviously to use 25mm tubes so that's a nono. I fear that it's my printer that is to be blamed. Does anyone have any advice on how to solve this? The feet are a bit more snug than the rest, but they are split all the way so they flex open. I would make a large calibration print to check that 100mm prints really close to 100mm X,Y, and Z, most don't check Z that is usually the worst one, then do a 100mm extrusion test to make sure you are not over extruding. I've edited that part and designed it to have a diameter of 25,7mm (after several trials) and when printed it became with a diameter of 24,7mm, again the 1,0mm systematic error. Now I can finally place my 25,0mm aluminium tube as tight as yours but still be able to move it easily enough without risk of braking the piece due to the designed split! Nice! What kind of printer do you have? Another one nobody ever seems to check is if your machine is actually square. You don't need to print a cube that is a waste of time, there are lots of calibrations objects on thingiverse, just use a large one. If the numbers are off you need to correct your firmware. Oh, I forgot about that. My printer is a BQ Hephestos 2, which is a Prusa based printer. The firmware is updated. This printer specifically has autocalibration, where a magnetic sensor detects the distance of the extruder to the glass (not heated) bed, which has beneath the glass a metal sheet, so the sensor can know the distance and thus autocalibrate the bed slope. I love this printer that makes very high quality looking objects BUT when having to make parts to fit, like now with that part I've told above, it's pretty bad. Everytime I download such kind of object from thingiverse I have to adapt it or things wont fit usually for being to tight. Jeez! Now googling for a quick and easy method to calibrate a printer and I find that it's not quick nor easy! It should be really easy if you own a pair of calipers. You print the test part, measure it, do the math problem to adjust your steps per mm, flash the updated firmware, print the part again and verify it worked. But 99% of the time it is an extrusion issue. In your case I would bet it is feeding too much filament. Heat the printer up. Mark 100mm on the cold side from a fixed point, tell it to extrude 100mm I bet it is going past your mark. adjust the steps per mm upload and check. lots of vids on this if you don't understand my simplified steps. If you have a printer best to take the 10 minutes and calibrate it. First I couldn't visualise your explanation, but after researching I've seen a few examples and finally got it. I've made it extrude 100mm and 100mm it consumed, so it's not the extruded so it must be the X and Y axis. I've tightened the belts but the error didn't changed when printing a calibration print of a small cube. Now I see that I have indeed to alter the DEFAULT_AXIS_STEPS_PER_UNIT variable in the firmware. Shouldn't this be "perfected" when the maker produces a new version of the firmeware, or is this something specific from each machine and the user should tune it (if I made myself clear)? The X and Y should be spot on or at least really close, but for some reason some manufacturers seem to get it wrong somehow. Also I forgot to mention. Try another slicer, you would be surprised some actually don't always seem to get interior holes right. This would be if your exterior dimensions are correct but interior is off, usually small. If it is a common issue the manufacturers forums should be full of tutorials and fixes by users. Sometimes the manufactures don't really say anything but the users always do. I never thought that calibrating would be such an adventure, but at least I've been finding a lot of interesting things I had no ideia until now. I've learned more about how to tune the firmware, to calculate the values to insert on the DEFAULT_AXIS_STEPS_PER_UNIT variable on the firmware. Now, after finding that somehow I was unable to communicate via USB to the printer I had to find solutions for this problem, so I could flash my custom firmware. In the while I've found this Repetier software and with it I was able to connect again to the printer. I'm liking it because it has a lot controls, graphics and informations that I didn't hat with Cura or slic3r. I've printed directly from the PC a new cube and the results were not yet perfect but almost. The X and y had only 0,2mm difference and the Z was on the spot. 1.5" will work, you might have to file two of them down a bit though. I ended up just getting the 1.5" ones, put a regular nut on them, took a bolt cutter to them, then grinded off the rough edges and they seem to work ok. I just wanted to say thanks for creating this machine and sharing it with all of us. I've been wanting a CNC router for several years but just never could make it happen. I just acquired a Hictop Prusa I3 and got it printing tonight. So a MPCNC is in my very near future! Thanks a Gazillion! Sweet! Thanks for trying it out. I was in the same boat so I made the cnc, you are getting started at a great time, machine has been updated and the software is really coming along nicely even in the last year. I had one of those printer, got it from amazon I think. Sadly it did not last long. I do punish them more than most but... I would say put a small fan aiming at the board. I had every part go bad, the board, power supply, screen, and extruder. Cross your fingers that I just got a dud. Luckily you can replace all the parts pretty cheaply. Let me know if you start to have issues, I might be able to help trouble shoot. Shouldn't be an issue there are hundreds if not thousands of these builds now. What did you measure? I would suggest printing a roller assembling it and put it on the tubing. That might explain things. Yeah F should be 25.mm, are you using something other than PLA, Shrinkage? Check you extrusion rate by doing the 100mm test, you might just be over extruding. Luckily the parts should flex and still work. Even the 23.5mm parts are not made at 23.5, all my parts have a little extra or a little less but in depending on print orientation. the locks all should be designed at 25.2mm and print at 25. sounds like you print or filament is causing some issues. I'm using PLA. I'll try what you suggest. Thanks for your quick response. is it possible that the radius from the toolmount dont fit with 25mm pipes? The z mounts are .1mm looser because of the orientation they print and the fact that they are clamps. But it works out as a wash when printed usually. Small imperfections on the print surface of the tube section of the tool mount can cause big issues. is there any blog or anything, slow accelerations causing rounded corners? Either way wrap some sand paper around the tubes and give the tool mount a quick scrub, that should clear up any slight imperfections. Thank you for this great machine. I really had fun making it. I just assembled the new Z-axis, but the it seems to be a (too) tight fit for the Z tubes. Especially the XYZ part seem to flex when I push the tubes in. I have imported the XYZ stl file into my CAD program(onshape via freecad)and added the bearings. As far as I can see the "circular distance" between the bearing is approx. 24.6mm. This seems tight, Is this correct? All the parts are an iterference fit, I don't have that dimension with me but that sounds close. Are you having issues or does it just seem tight? Did you follow the assembly instrutions, the order of assembly it crucial on that part? It flexes a bit more than I am comfortable with. Maybe it even pushes the center assembly so it is not square. I will check this. What I mean with the "circular distance between the bearing is approx. 24.6mm" is the tube diameter. As far as I can see in my CAD program the XYZ part will only fit a 24.6mm tube(before it flexes). Is this on purpose? Have you assembled it and are having a problem or just worried about printing it? The parts are all designed as an "interference" fit. The measurement you are worried about is measured at the tangent of all three bearings. The tangent is one single point on a flat surface, in reality the bearings will sink in bit, and the part will flex and relax. If I did an exact fit the assembly would be extremely loose. This offset has been the same on all parts of all the machines since the second month of the design, about a year and a half now. originally some had more some had less, after the redesign this has no longer been needed. I got the same matter on Version 1. I think, it's helpful for the bearings to not slip. After a while i used smaller bearings with rubbercoating. So my machine is very hard to hear. Only the steppers make notable noises. What kind of bearings did you use, chiora? I'm currently sourcing parts for my build and noise is a factor for me. I used the 619/8 bearings. 608 bearings have 8mm inner diameter, 22mm outer diameter and 7mm width. 619/8 have 8mm inner diameter, 19mm outer diameter and 6mm width. I put a washer aside each bearing to correct the width. For the outside i made some rings of polyurethane and pushed them over the bearings. Or you can use some strong rubber tape. I know, a bit unsatisfying these answer. But i wanted some smooth running bearings and ended making them by myself. It's like the dual extruder head i'm making. "8/8/16 - Fixed a small dimensional error with the corner assemblies. -Thanks Martin S"
Could you explain whats wrong with the old parts? And maybe how to rework them? Thx a lot. No problem. The old ones are fine. Gap between rails was off by a tiny bit, should have no effect on anything. Just had to release the correction. Thanks for fast reply. Just want order screw so need confirm. Nice work. just wanted to know that i have a spare mks base 1.2 board. wondering will it be able to work? which is BTW a remix and all in one board of arduino mega and ramps 1.4. The difference is it uses A4982 stepper drivers instead of A4988 as in ramps 1.4. Yup no problem. The boards look interesting, your going to need to do some firmware work, but nothing major. I've just started gathering parts for my build. Just curious if there's any specific reason for the choice of M3.5 screws and nuts? M3.5 is an odd dimension and hard to come by, except from specialty stores (i.e. pricey and difficult to come by). Would opting for M3 or M4 compromise the build quality? You can order M3.5 screws at Farnell. There costs a pack of 100 around 4 bucks. M8 and 5/16 bolts are extremely similar, but 6/32 screws are closest to M3.5. In the US they are the same price as M3 and M4 and just as available. Some parts of the world it just does seem to workout that way but does in others. Either will work, use M4's where they will fit and M3's when you have too. The M3 are strong enough but just have a very small surface area, washer might work but are a hassle as well. I am actually facing the same problem, impossible to find M3.5 screws and nutlocks, so thinking about using M4 like you mentioned but am i not going to face a problem where you will have to place M4 nutlocks in the nutlock trap and tool mount of the Z assembly when its designed to receive M3.5 ??? Also do M4 screws will go through M3.5 holes of the croners assembly ? You can't order them online? I don't have any M4's to check. Others have used them so I assuming it is a tight fit. Thank you for your reply, Allted. No worries. Not the first time I run into this issue. I'll go for the M4/M3+washer option. Great work and superb support on the MPCNC! Can you up this old part ? don't want to change all the middle part. I'm printing the F-Roller right now. Can you please explain where the difference between the F-Roller and F-RollerM is? They seem to be virtually identical expect for the slope at the bottom and the top. Do I need two Rollers together on one axis and two RollerMs on the other? Or should one RollerM always opposite of a Roller? They are mirrored because some people have printer quality issues, this ensures a more square initial build. One of each on each axis. I hope to get the new build instructions up this week. I've start a few days ago to print and I hope I'll finish it soon. I have not download all the files and now I miss the roller. The rollers are both there. Am I not understanding the request? Oh sorry !! you're right, xy are the Roller for the middle. but I am not sure if they are a bit overkill and they might be too deep (also quite a bit more expensive). As always thanks for any thoughts, I really appreciate the effort you put into supporting your awesome design! What is your intended use of the machine? I will be using it mostly for milling wood at least initially. Does that mean I should go for the beefier motors then? Milling what? Wood, foam, soft plastic? I wouldn't worry about it. We used to use 42oz/in and I milled aluminum just fine. Bigger is nice but not necessary. Yeah wood mostly. BTW I edited the link in my first post, I had put the wrong one. Basically I'm wondering whether double the price is worth it for 107 oz in motors. No, 107 oz in are too big. You will actually lose some build area and have to get special drivers that can handle them. I think this works well from 42-85oz/in. The link to the second ones have odd specs, They seem very similar to what I sell, but can't say for sure. The first ones are fine if your machine is setup well. I used 42's to mill aluminum early on in the development of this, it is best to up them a bit though. I actually ended up ordering these today, the price was too good to pass up and according to the specs they have 64oz holding torque and they come with 1meter long cables so I do not have to splice. Thank you for the quick reply. I really look forward to building this given the multi-functional uses. I have lined up all of the components except motors and 1 1/4 bolts having trouble sourcing this size locally. The Dewalt drywall cutout tool is more then enough to cut through aluminum? Hello Allted I got busy by the beginning of the year and never had the chance of finishing my machine, however I had most parts printed except by the Z motor holder and rails. I just did a quick test on sketchup and noticed for the new parts Z rails distance is wider so it won't match what I currently have printed, have you kept older files somewhere? They were up here somewhere but I didn't post them and can't find them right now. What size machine and what files, just the z motor mount? IE version. Planning on using it with a dreamel for the time being and upgrade to the dw660 in a month or so. I'm missing the files to print the motor support and tool holder. Nice I still have that one up. and if you do a search for "mpcnc dremel" I am sure you acn find the right mount. I never made a dremel mount. Good luck. Let me know if you get stuck. Thank you man! I'll post some photos and a video as soon as I'm done. Tool mount for old MPCNC IE, please? This one isn't suitable. The old style was built into the tool clamp itself it was not universal. What tool are you trying to mount? I have never made that mount. This one came up in the search, it is not mine but should fit the old center. Allted, I'm in the middle of printing the parts for one of these things and I'm having trouble with 'CenterXY', mainly due to the print warping itself off my printbed about 30 minutes in, I think the cause is the relative narrowness of the footprint of the part. I'm using a Kossel Mini with masking tape and glue on the print bed, do you think rotating the part onto it's back would help with the issue? or should I raft it? Ok, I'll redo the tape and try printing without the glue. Yes, I'm using MG Chemicals Purple PLA (https://www.amazon.ca/dp/B014PF0O1U/ref=twister_B0162FGO7Y?_encoding=UTF8&psc=1). Looks like it's partially just my build plate being persnickety, but I'll definitely try rafting it. Sounds like you got a few faulty or mis-branded spools, the ones I've had are quite solid and I haven't had any issues with the 2 spools I've used so far. If you have problems try see if you can find a piece of Polycarbonate and print on it. - It's sold as FlexiPlate and is very good at keeping things in place. Just remember to use plente of clips to hold it down, as it does flex when it heats up. I'm using PC as the build plate on my second delta, the problem was on my primary printer and turned out to be a failing thermistor that got replaced this afternoon. when using blue tape, ive found that 3m is garbage for 3d printing. if you're in the states, then i suggest going to lowes and find the BlueHawk brand for tape. I buy the 2.88in. rub a little alcohol on it to clean before printing and i seem to never have issues with it. Alguém ai entendi essa listagem de tubos ? The instructions are far to detailed to try and maintain on thingiverse. I hope most everything you need to know is covered at the website. Suggested cut sizes and two custom sizing calculators for custom builds, imperial and metric. the "Roller M" from the partlist here: http://www.vicious1.com/blog/parts/ is not included tin the Thing Files here? It shows on the list for me. thanks i see them too now, i have downloaded the zip file and extracted everything but i missed a few files. Weird! Is it possible for you to make a new render or new photo to show the newest/different version/s? I had to wait for the render to finish. I am updating the pics now. Awesome. I can see why it could be of use to have a stiffer upper part to avoid flexing, but is it really necessary to make the lower part this much bigger? I'm not done building mine yet, but have printed my rollers and the lower parts seems extremely rigid! The lower parts got much smaller, 2 hours less print time each. Not sure we talk about the same thing. I mean "F-RollerM.stl" It takes 4 hours 34 minutes on mine 86 grams of filament... the old "IE_Roller_F_25.stl" took 4 hours 49 minutes - 92 grams of filament. My question was really: was/is it necessary to strengthen the lower part? It is smaller in height, but much more bulky. That doesn't make sense. For me with the exact same slicer settings, the old one took about 6 hours, the new one about 4. What is the difference between Bottom_CornerF and BottomM_CornerF? Some are denoted F while others have IE in front? I guess IE is international, but? Let me know if I can clear anything else up. This is good feedback I will find a way to make it easier to understand for the newcomer. The large F-XYZ is backside of Z-axis, or? It doesn't show on any photos I could find? That way it is easy for you to add different sizes later on and not speculate much in wheter they are metric, emperic or what else the sizes are named. Try not to use two different denominations for the same thing, like IE and F.
This takes a lot of time but it can be done simply by taking a few photos of each assemly and write part name on the photos. Or just use photos, if the writing is too time consuming. Getting there, I need to finish all the parts first. It is not easy to maintain 3 sets and answer tech support questions. There are pictures with labels when you click on any one of the links, I'd rather not spend the time making and updating thumbnails when it is automatic on thingiverse. The new parts are following the legend based philosophy, c-f-j (small letters that are obvious when they are mirrored), I just have not had time to rename the parts that were made before the legend was necessary. 6 months ago there was only 1 machine, now there are 3. There is a method to my madness but 1 guy can only do so much in a day. I appreciate the feedback and will tidy it up ASAP. I congratulate excellent, I have a question about setting arduino where I can find? prodría me where I can pass data down configuracón thank you very much and success. That would be very big, it can work depending on what material you are trying to cut. You will need mid span supports. Thank you for response, i will try in the near future a Mpcnc without mid span supports and dimensions of 3 by 2.2 meters, i will be cutting laminated plywood. can i use infill rectilinear? If i use honeycomb its too slow, bud with rectilinear is more fast form me. Sure, no problem. That is what I use. does somebody have STL for OLD IE corner? I need 1 piece and I don´t want print all new parts. Also, I´m confused what mean C, F, J on new parts? What old corner part do you need? You can replace a single corner with the new one as an option, if you need to print a part anyway might as well start printing the better ones right? C (23.5mm), F(25mm), J(25.4mm), are the size indicators I use so people don't print the wrong parts. People were complaining about poor fit, too tight and too loose, crooked, because they would mistakenly print parts from a different versions, so I added a label on the parts so it was easier to distinguish which parts were actually printed. I have a lot of play in the X/Y axis, but the 25.4mm stainless seem to fit well with the F25 printed parts. Will that be ok? I need middle piece, old Corner Block, but if I can swap it with new design I will print that one. Depends on what you are doing with the machine, 3d print and laser go with the small motors. Milling/routing, use the bigger ones. Although those are a bit over kill, make sure you have the power to drive them. These kinds of questions will get answered in more detail in the forums where more people than me see the question. That first amazon link is a better option. Thanks for the reply, any reason in particular? Is it that the steel is better than alu? I feel the aluminum is not as rigid and the surface is soft enough that the bearings will probably wear in tracks making for a loose fit. There are two versions of F Nutlocks. 11mm and 13mm. What is the difference? Which one has to be printed? That is the flat to flat measurement of your coupling nut. If you bought the kit from me it is the 11mm one. someone tried to mill a sheet of carbon fiber? Carbon fiber should be very easy to mill. The downside is it wears down bits pretty quick. This gets asked a lot for frames but as far as I can tell no one has posted pics yet. Comes up a few times in the forums with bit suggestions though. CF is a bit pricey for me to just do some test cuts, and I don't have any more quad parts, sorry I don't have any first hand experience. You would probably need washers. Nothing available online? If it works it works, I don't think the "c" bolt will change anything, so if you need to snug it a bit go for it, if the x and y rails are in there snug leave it alone. All mine are loose as well. The prints came out perfect, no wrapping or distortions on the pieces so the fit in was like making a puzzle. so this small space between xy and xyz pieces in not something I must check and pay attention. For applying same tension on upper as on the lower xyz ?! I don't think so. If you run it for a while things might seat themselves a bit more and the gaps will probably go away. There is a .5mm gap on those pieces so you are really really close anyway. I am already moving in the upgraded version of mpcnc. One small request if possible. Could you please make a locknut version for 3mm conduit, meaning out of 25mm conduit a 22mm Dia locknut?! That would be great. I don't think I understand your request. In the whole design there is a locknut piece for the Z-conduit and tool mount platform. This is designed for a 2.35 ID conduit since the most common is 1.5mm thickness one. I have found 3mm thickness conduits which gives a 2.5 OD and 2.2 ID. If there is a possibility to add such a piece it might be useful for other people that might want thicker conduits for bigger cutting area. I hope at least i explained my request better this time, excuse my english are also rusty. thanks in advance for reading and replying to my request. I see what your are saying now, the nut lock pieces. I can't do it today but I can try making a parametric part if I have some free time in the next few days. Never done it before so it might take a while. If you need it before than you can just sand down the current parts. They are really only there to keep the nuts from spinning. Your English is great don't worry about that. couldnt he just use the nuttraps from the 23.5 version? I'm using Cura for slicing and the holes for the pipe are measuring 24.33mm. Was wondering how to fix this or if its a scaling issue. I would test print calibration cube first and make sure it isn't a printer issue. That seems a little too far off to be a slicing issue. You should never have to scale a part. I would try a different slicer then. The parts should not need to be scaled. All the parts have been tested successfully as is on many different printers and slicers. You should be closer to 25mm but does the conduit fit? A tight fit is better than a loose fit. What part exactly are you measuring? This is the 25mm version. If you printed the regular version foot and got 24.3 that should be a loose fit. I am confused. The feet shouldn't be an issue they have an open seam and should flex to accommodate print issues really well. New feet are in the works but nothing ready to publish yet. Did the rest of your parts fit? 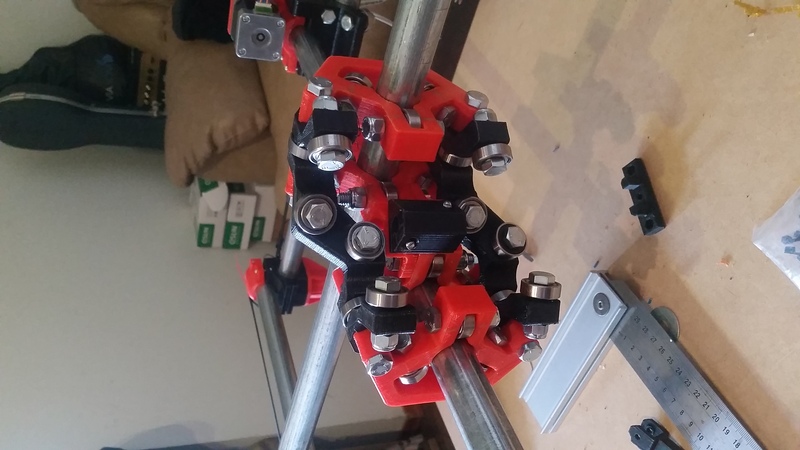 The Z axis seems to move smoothly but the carriage for the X and Y is really tight and moves very roughly. Also the corner blocks had the same measure for the conduit hole (22.90mm). It seems that almost all the parts I printed were a bit smaller than they needed to be. The cut list for the previous version will work. u could put more detailed pictures of the new design of the z axis? Just got lucky and got in between versions of the parts. I even printed some parts of the new one. But the majority of it is for the old, so will need to keep it that way for the time being. In any case I did not got the full "thingy" before I started to print and don't seem to find the remaining of the parts. Can someone please post the all the parts for the older International version? Thanks ben, I have sent a message. I hope this is OK, Allted? I have noticed that you do not include the ToolMount from the older version. Is the new one compatible with the older center ? In the new Z center parts it seems that the threaded rod is further back, giving more clearance for that clean toolmount. Completely different none of the old mounts are compatible. Sorry I miss typed. The old mounts are not compatible. If you are using the new center and zaxis you will need all new mounts that fit this universal plate. All the new mounts will fit all 3 different sized machines. Hi again, unfortunately now I am a little confused. Is the new mount plate compatible with the old center and zaxis? Is there a list of mounts on the old one. Something you would recommend? I have made the ones I recommend (found in my "things"), if you need something different search "mpcnc"
Is there any way to use dual stepper drivers for X and Y axis, instead wiring it seriel? Actually E0 and E1 sockets just have to get the same signal like the X and Y socket on ramps1.4. Is there a option in Marlin? it is not an option for more than one option but you can re-code marlin. That being said this machine has never lacked power so I feel it is a wasted effort. Rigidity has always been the fight, but now with the new parts things are even better. I grabbed the complete zip for the standard set but forgot to grab the full zip for the IE. My stls are individual folders, Do you know the ones you want? If you don't have them already why not just print the new ones? Well that is a lot easy to get for you that all of the parts. When I get back to the shop I'll get those. 4 hours of emails this morning, I need a break and I have orders to ship. Hi, a little warning here - don't use ABS to print this machine. I've printed this with abs, and the whole design i soft anf 'flexy'. Folks, before you start printing all parts, make sure your printer is calibrated and the slicer is set to let the printer do what you expect. That takes some minutes or more, but it is really, really worth the time. I had calibrated and tested my OrdBot printer and set and tested (there are tons of calibration objects out there in Thingaverse) for precision, scale, tram and orthogonal correctness. Likewise, the extrusion factors influence your outcome more than you would expect. You will get a much better understanding of your printer during this preparation, and the result will overwhelm you. Be aware that every fine setting varies for different filament materials, even for different colours of the same brand, so make sure you get uniform results. Allted has provided such an ingenious design here, it would be bad if you screw it up with an ill-set printer. The parts I made for my machine never needed any postprocessing (working with 25mmOD, 2mm wall thickness polished VA (stainless steel) tube normally used in the boating industry). Pluck them from the building platform, put them together, a bolt here, a nut there, and it fits. Awesome. Добрый день. Не подскажите. А трубы надо чем нибудь смазывать? Подшипники туго скользят. Или это нормально? Hi can i still use all the size of bolts for the normal version on the IE version? Amazing work!! I have been thinking of this exact project for some tube stock I have left over. I see you have been asked over and over about the pipe sizing so I won't go there but I'm very sure I don't have the exact size. I am willing to scale up to the nearest tube I have and report my results. I see most of the frame should work with that technique but the middle looks complex. Which is the best part or assembly to print for a test? The problem with scaling parts is all the bolt holes will get bigger as well. As the bolt holes get looser the bearings will start to move unpredictably due to sloppy bolt fit. 25mm stainless rail is pretty easy to find usually. If you can't find it at your hardware store as curtain rod or shower rod. Boat companies can usually get it and I can get it online though ebay, and online metal suppliers. This would be a much better choice that scaling. When using the better middle Z i understand two is enough, instead of 4 for the original one. But for the Middle Z IE v2, how many do I need of those? These are the ones that you link to IE users from the Better middle Z part. 2, it is the same part. I just moved it to try and make this less confusing, guess that isn't working so well. Hopefully When the updated parts have been tested and released this will get easier. Okey, thanks! I see now when i look in the old zip there are only 13 parts, whereas here there are 20. If we exclude split up corners contributing to extra STL, it seems that the Roller_Motor_Mount and Foot_Bottom is missing in the old upload. Was the roller motor mount not needed in the last version? Im confused. Anyway thank you for an completely awesome build, much appreciated! They are still here on thingiverse, they were just different "things". I am just trying to move all the standard parts into one "thing". This has evolved over the last year and we were trying out different parts. Now with the new parts coming out all the parts will be in the same "thing" so I don't have to maintain a recommended list. Awesome job. I am a professional mechanical engineer and I think this is a very elegant design. Could you let me know the centre to centre distance between the twin z-axis tubes for the international version? I would like to design a tool holder and I'd like to get make sure the z-axis tube separation is spot on. Here I find 25,4 mm OD. For what I read this ones wouldn´t work, right? I was searching and here is impossible to find 23,5 or 25 mm. The 25,4 mm OD is very easy. You say that this ones not work "not yet". Are you working on a new version? Is there an estimated time for this? 1 of the 4 assemblies are done all the rest are being prototyped and tested. No ETA yet. look at closet rod and shower curtain you should be able to find 25mm stainless somewhere. I will look the closet rod and shower curtain and try to find. Thank you!!! Just in the process of building this, for the Aussie builders I've just discovered 25mm OD (accurate) x 1mm wall aluminum tube at bunnings. It's sold in 1m lengths for about $6, a bit of waste material from this but the price is good. It seems fairly rigid but the test will be in the build. Yea seems this is a common issue with 3D printers, it is just plain physics that the printer will drag the filament across the hole and you end up with undersized internals. The answers seem to be over sizing any internal bores or using a slicer that adds many thousands more triangles. I had the same issue so I just purchased an elcheapo chinese step drill that ended at 25mm (heaps on ebay) and used that to bore through my internal tube fittings. I think if you printed with 2 or 3 shells it would not be a problem to do this, if anyone else has a good answer for printing accurate internal holes I'd love to hear about it. I had the same issue. I found out, i had a too big extrusion width in Slic3r. The extrusion width was set to 0.6mm. I measured the width of a simple line of extruded filament. It had 0.8mm. After changing the extrusion widtf in Slic3r i had no more problems. Cooly. I'm going for a larger machine and the 2mm stainless will give me the added support I need. Have finished printing the 2 updated z axis mounts and 3 of the 4 corner blocks before my feeder tension screw stripped late last night and fouled up the 4th one. Damn you polycarbonate and your shiny hardness needing extra feed tension! Hi guys. Firstly let me say AWESOME. Second I have seen a few guys from Australia having trouble finding 25mm OD tubing. Scroll down to 2mm WT (wall thickness) and the 316 version is stocked. They have branches in each state. Awesome thank you. I'm considering spans of 1m in both X and Y directions but am thinking about getting tube with a Wall Thickness of 1.5mm to keep the weight and inertia down. Allted, Ireul, do you think a WT of 1.5mm is strong/stiff enough for 1m spans, or should I go 2mm? I may go 1.2m spans if I have to buy a 6m length. I manage to find some stainless steel tubes of 25,5mm OD. Will this printed files work? or do I need to mod them? I'm eager to start building this machine. Sorry 25.5 won't work. Whenever I have a few moments of free time I am working on an adjustable one, but not anytime soon. Thank you for your quick reply Allted. No worries, I will try to find 25mm tubes. Awesome machine by the way. I'm trying to find some 25mm myself. Nothing under $200 around here. I just gave up looking for 25mm OD tubes, they are insanely expensive around here. 1'' OD tubes (25.4mm) are very easy to find and relatively cheap, stainless steel or standard versions. Would it be terribly wrong to scale everything up by 101.6% and make it fit 25,4mm tubes? Just yesterday I finally found some 25mm stainless......Shower curtain rod $14/6'. Not bad, I compared it to a 6' emt, the emt was a tiny bit more rigid. So maybe not the best for giant machines but this things is going to make a super smooth small to standard machine!! True, I didn't think about the bearings. I think I will just print one of the rollers at 101.6% and check. A 3mm hole ends up being of 3.048mm. The space for a bearing to fit is 7mm and scaled up 7,112mm. If everything turns out ok I will post the results. PS: I don't want to confuse people with this tests. Allted let me know if you want me to delete this comments. I've just printed 90% of the parts, now I've started assembling it and noticed the rollers are too lose. If i push the pipes to the bottom bearings, there is 1mm space between pipe and upper bearings. Printed parts seem to be ok because the corners fit perfectly. Also, congratulations for such amazing and beautiful desing. 2 days of calibration and a lots of cubes later, I managed to get a quasi perfect cube of 20.02×20.03mm. Recalibrate the Steps per mm and it will be good. Odd, too big has not been an issue before I don't think. Everybody always thinks its to small. All you measurmenta check out. Is it just the rollers that don't fit? Maybe jump on the forums and put up some pics. Good day. I am weak in programming. And only until he learned to type left literally 6 parts to print and you can collect. So any problems with this item. Please tell me a "IE_z_nut_lock_smaller_coupler_11mm.STL" and "z_nut_lock_11mm_coupler.STL" equal parts and the parameters and size? I just checked the parts list and I see an 11mm version and a 13mm version. This dimension is the outside dimension of the coupler nut it fits. Good day. Type for pipe 25 mm. can't print IE_z_nut_lock_smaller_coupler_11mm.STL. Start printing some point. Lifts the extruder over the table to 3 mm and plastic drives just. Tell me what the problem is. Download the part again and re-slice the part with a different slicer, the parts don't have any errors, but you could check it with netfab if you are still having issues on your end. This is for the 25mm conduit. You should be using this, http://www.vicious1.com/blog/parts/ , as a guide. exactly I have NO IE version, I have printed the components of that list. For this reason I wanted to see if I have to throw it away or I can use it anyway. This is just awesome, Allted. Really nice design ! I am printing the IE parts right now; I am planning to use an ER-11 spindle to cut wood. Do I need to print a special collar / mount for that ? Yup for those spindles you will need a mount for it. I am pretty sure there are few of them on here for this machine. If you can't find it i can help when I get back to a computer. I've read many comments now and I'm still not sure if I can use metric screws with these parts. 5/16 seems to be close enough to M8, but what about the others? M8 and M3.5 if memory serves. No problem, or I haveverything for sale if you want to make it easy on yourself. Anyone bought components / built this in Brazil? I'm trying to find some of the stuff and would like some help. Thanks. Hey Allted, is the IE version got the same dimensions of imperial version? I compared the stl of both and they are the same! !? Definitely different, by about .4mm center to center difference on the holes. The are correct, promise. There are several hundred build out there already just in the international version. We corrected all the sizing issues very early on. Y E S the pieces are OKEY!!! My bad Allted. I just recently finished one piece and the dimensions are ok. Sorry! For what size of tubes is the IE_Toolholder nut trap diameter designed? I built it for the 25mm OD, 21mm ID tubes (that means 2mm wall thickness) I have and found that it is way too big - after checking the STL files I see that the OD of the cylinder of the nut trap is about 22.5mmOD - 1.5mm too large. Would it be possible that you provide either a slimmer version or a scad file? Thanks! So... What is the biggest part ? Well, i printed all parts in a Micro3D with 104mm x 104mm x 94mm. So there won't be many printers which are too small to be printed. That is pretty small. Version to of version 2 has a 170 mm x 100mm piece. hmmm. Maybe I need to rethink that and start on version 3 of version 2. Well, then they should print Version 1 and print Version 2 with the Version 1 printer. I will reprint all parts with the new printer. Because the Micro is not that good or fast or accurate as others are. I planned from the beginning to print the parts again. The Micro is really slow. The Roller F took over 26 hours at medium fill (~30% Hex) and medium layer size (0,2mm). So overall it took me 400 hours printing all parts. Maybe you make a bigger part and two smaller parts you can choose from and print the bigger part later. I like your thinking! Print V1 to print V2, awesome! Bummer on the long print times though, yikes. I haven't done anything I am super stoked on yet for version 2 so it is a ways off yet. So most likely it will be, print version 1 if you have a small printer, version 2 if you have a regular printer. I don't see there being a huge performance difference yet. I haven't made any break throughs just fixing minor issues. In the Z direction? Roller F under 75mm. Sorry, i meant in the two others. Because of the bed sizes. And thanks for the fast answer ! What size is your bed? You can open any part up in your slicer an see if it fits. I have not heard of anyone having an issue. The better middle z is 130mm but can be printed on the diagonal to fit if needed. X Y Z is 145x110x200 for now. I'll start to print the machine each time i can and see. Hi again this space is normaly? Yes, normal. Both gaps are a bit big but will work just fine. If the International Edition uses metric bolts, screws and nuts, where can I find full list of them? No big deal, I know that I need to organize the site better but, web stuff isn't very exciting to me. No problem to get 25mm stainless steel, polished, or aluminium tubes in Germany. You have to visit a real hardware shop, not the DIY markets crap. Adolf Richter in Kiel for example has this available, but you should find them in every major town. ich habe das Ding gebaut. Du kannst 25mm-Alu-Rohre im Baumarkt (Globus, Toom, Hagebau) kriegen oder 23,5mm Stahl blank. Kannst also sowohl IE oder normal bauen. Irgendwie glaube ich, dass das Konstrukt bei Alurohren viel zu viel Abrieb erleidet. Bin mir noch nicht so sicher, ob sich dieses Gerät preislich und vor allem bezüglich der Haltbarkeit gegenüber beispielsweise einer RAWCNC überhaupt lohnt. Da ich das Ding für einen Laser-Cutter brauche und ich gummierte Lager habe, kann ich Alu verwenden und brauche keine ausgeprägte Stabilität. Zum Fräsen habe ich eine gebrauchte Gildemeister. Mit der Printed kann man auch Aluminium fräsen, muss aber halt Abstriche bei der Geschwindigkeit machen. Ein CNC-Rahmen für einen Lasercutter für unter 200 Euro mit einem Arbeitsraum von 60cmx60cmx30cm kriege ich nicht für den Preis sonst wo her. Naja, ich habe viele kleine Teile auf einmal gedruckt. Zum Beispiel die Rollerbügel, die Füße, die Eckverschlüße. Dann sinkt die Druckzeit rapide. Und ich habe nur einen Micro3D. Also richtig langsam und kleiner Bauraum. Kumpel von mir druckt alle Teile auf einmal. Da sind das 90 Stunden. I had a blonde week and printed all of these parts when i should have been printing the 3/4" u.s. version. The 25mm measure on this, is that ID or OD. I need to find a replacement and knowing the ID or OD of the original intended is going to be important. Size is very important. There is only a 1.6mm difference between them and it was absolutely necessary. Dimensions are OD, ID does not matter. I need to find an american equivilent. so OD is 25mm on this, just double checking. Hi there!? I'm from Brazil, yeah :D, I had printed IE parts, but i didn't find the tube 25.00mm here in Brazil :'(, I just find 25,4mm OD this can work well ? Please see my comment. I can not imagine these will even come close to working. I've tried 25.4mm before and it didn't fit. What was annoying is that it was labelled as 25mm but when measured was 25.4mm. I recommend taking one of the Z axis parts with bearing already bolted on so you can test it in the store. I am still yet to get my rods. I hope so but can't say for sure. Make sure all the hardware is loose when you put it together it will be extra snug now. I only have access to 3/4" conduit the 23.5mm stuff. I'm sorry. you might be able to order 25mm stainless steel tubes from an online metal store pre-cut. It is used for boat rails and things and they usually charge about $1 per cut. Please stop, I have commented 5 times now. These Aren't properly done you are missing so many parts. Please do not publish parts until you have printed, verified and used them. I will not get flooded with questions about why the 25.4mm parts don't fit right. Trust me it takes a lot of work and I have the original files, I screwed up the IE version 3 times. Hi again e found 24.7mm what do you tinhk about it ? You can always print the roller f throw some bearings in it and see if it is snug. If you wire them normally open, endstops will work fine with the stock firmware. is this the complete part or I still need to print some from the original version? You still need some of the original files. I did find this web before, but I used it just to find right bolts. if you google mostly printed cnc machine he has a website that has assembly instructions. first of all I would like to thank you for great design. We have almost all parts printed, and I´m putting printed parts together, but I have bit problem assembling Z axis witth middle v2 because I can not figure out how parts fit together. Could you please post assembly in .EASM format so we can see it 3D? Many thanks for answer and your hard work. So far i printed a few parts (i print on an Ultimaker Original+) including a corner block in PLA. But i get an inner diameter of about 24.5mm for the IE version. The stange part is that the outer dimensions of the part are exactly the length cura shows me. (48.4mm x 53mm x 53 mm). Because i dont got my ballbearings yet i just printed out 3 dummy with and OD of 22 and put them in the middel joiner and this part fits the tube just fine. So i am undeterminded if i should just sand out them corner blocks to fit my tube. Hey. Great thing you've made there. It really is nice. I'm printing mine at the moment. Just one question: Are there parts that are bigger than 109mm x113mmx74mm? I Think the middle joiner is a little bit too big to be printed. But i have to try if my printer is done with the corner blocks. Why i ask... i'm printing on a Micro3D which has a very small printing area. The middle end was really tricky to place, because it's slightly bigger than the print area in basic setting. Had to turn and move by some degree and mm. The roller block must be turned by 90 degree to be printed. Caused some rework to be done afterwards but that's necessary at every part i print. The middle joiner is the exact same size as the middle end other than being abut 45mm tall. Hi Allted, what were the problems that Asho777 found with the middle parts? Is it essential to reprint them? If the current ones work for you keep em, but the old ones were too tight. I had a CAD error and they only moved half the distance I wanted, so they were bigger than the standard but not all the way to IE size. I would say yes, worth a reprint. I'm very sorry to waste so many people's time and filament. No worries. I just like to know the details. I'd rather be notified of problems and the parts be corrected than not. Love your work, keep it up. I've been distracted from completing this built but am getting back on track. On the upside, there's more remixes etc for me to look at and possibly use. Awesome work. I am currently building one, but I have a question : can I use the standard version of the roller motor mount, or is there an IE version ? Hi Alted and thanks for sharing your awesome design!! I really like it and I wish to start to build it as soon. I can not find anywhere the length of each bar/piece of the 25 mm outer diameter conduit that that sustains and sliding all parts of your MultiTool, but I found only the total size of 12 ft of conduit needed, please can you list the length in centimeter of every single bar of conduit so I can start to order it? Many thanks in advance. I normally use the DuPont style connectors; but as soon the cables get thicker it is hard to get those working. I thought about Molex / ATX Connectors but I am not quite convinced with that idea? What terminal connectors do you use? Do you have any recommendations and what is your experience? I used cat5e cables and jack modules http://www.thingiverse.com/thing:858155. This makes a really clean assembly and all the cables can easily be unplugged. I also used some .1" DuPont style connectors hidden in the tubing but they were not really necessary. I use the dupont's. The only thing i do is extend them to get the arduino out of harms way. Hopefully next week ill have some custom wiring harnesses though. 25mm conduit. - outter or inner? My country don't have. Outside diameter 26.65mm. the Nut traps fro the M4 Nuts (Corner Blocks and Rollers) are to large, they seem to be for m5 Nuts (at least they fit perfectly). All the M8 Bolt Holes fit very nicely, but all Conduit Holes on the IE Parts seem to be very tight except for the Rollers, the seem to be perfect. I had to scale the new IE Legs by 2% and it seems i should have done that with all other IE Parts as well, like if i had printed the Imperial Parts. (i checked a few times, i printed the IE Parts). I tought my printer (Pursa i3) is off, but all calib Cubes, or the Parts for my ZMR250 fit perfectly. I checked my settings in slic3r but they looked good. Is the Spacing for the 25mm Conduit in the Roller exactly the same like in the Middle Joiner/Ends? New parts are up, sorry for the issue. Nice design everything fits precisely by me. Only the m4 nut holders on the cornerblocks and F roller are to big. Sorry about that the nut sizes very by company as well as by Metric or Imperial. Even worse is screw head diameter. No worries, still i have to thank you for making this beauty possible at all. Simply fantastic,This thing is a must build for any self respecting hacker/builder. Such a simple yet elegant approach to an otherwise complicated piece of equipment. i take off my hat to you sir. I was looking into the electronics and saw, that you recommend to wire the 2 X and 2 Y motors in parallel on the DRV8825. If I am going for the 1.7 A Nema and put two on one driver -> will that not strain the driver capability? Would it make sense to wire them in series - or did you not encounter any problems? There is a little more to it than that. I need to write a little blurb about this it has come up a few times this week. That isn't all the information. Tell me what the steppers are rated 1.7A @ what voltage? Here is how I've been doing it. 3.4v 1.7A = 5.78W --convert that to the 12v we will be using -5.78W / 12V = .48A -then de-rate it a bit to 90% (don't want it to get too hot.- .48A .9 = .43A Each. I these are pretty close to my steppers. So I set the Z pot to .4v and the X and Y to .7v Any more than that and you really need a fan always on the heatsinks. If the steppers are getting too hot turn this down a bit ( I aim for warm) if they aren't warm you can get more power out of your steppers by turning this up a bit. Too high and you will over heat or miss steps all together. This is only for the DRV8825, the a49's are different. This is a great design, and I am currently building one (will post pics soon). My only concern is, is anyone else finding some parts a bit too tight ? I've had to re-design the locks which sit on top of the roller blocks, because when I clamp them with the conduit installed, it puts way too much force on the plastic loop which holds down the other end of the lock (potentially breaking it off). I have similar problems with the corner mounts and the locks that sit on top of those, it's like the 'hole' the conduit fits in is too small (I measured it with calipers it's about 24.2mm). I'm using 25mm dia. 1mm chrome plated steel tube (think towel rails). Works a treat. None of my issues can't be solved however, and it's coming together really well. The conduit slides perfectly through the roller bearings once everything is fitted, with no slack. This tells me that everything is printing dimensionally accurate, so my problems are a bit of a mystery. Brilliant work on the design though, and I'll let you know how it goes. The locks that sit on tops would be difficult to measure diameter because they are not complete half circles the will seem small if you measure the edges. You shouldn't have to tighten anything enough to break. You do not have to clamp any of the locks very hard at all just a bit snug. Nothing on here requires tight, everything snug. This is a first hearing those parts are too tight. All the other times were wrong parts printed or just hardware wrenched down really tight. It's plastic start light, you can always tighten it later if needed. Yes, sorry. I meant the holes I measured were the ones in the corner mounts that the tubes slide into. It's so tight that I have to pry the 'jaws' of the block open to slide the conduit through. It's not ideal (the bottom and top of the block are at a slight angle to each other, ie. not parallel flat) once the tube goes in. Same goes for the top locks, there is about a 3-4mm gap between the lock and the mounting block (I've put a couple of springs along the screws to fill the gap, which works nicely). Like I said none of this detracts from a brilliant design, it is quite possibly a printing problem (maybe the locks are 'sagging' in the middle when they print ?). The beauty of this 3d printing gig is, I've found, when something doesn't work you can try a different approach easily. These little niggles aside, it's going to be a very solid machine when its done and I'm eager to get some pictures up. Maybe that's it. The locks should be printed standing up. They are much much stronger this way and more dimensionaly accurate. I'll makeba note to correct the stl's. I know they are oriented right on the other version. Does any one know the maximum size build people have successfully made? I am thinking of a large build for wood but would like to know if any one has had any success out there. I'm not sure what size you are trying to get to, or what the biggest build is yet. Here is what I think about the size. If you get over 3-4 feet in any direction you should use some supports under the outer rails. The biggest effect of a large build is going to be in the z direction. X and Y should hold much better than Z. So if you are looking to cut full sheets I think you will be fine if you cut through a little extra into your spoil board. Don't expect full sheet 3d reliefs at crazy speeds. I tell everyone figure out the biggest piece you might cut and try it out, very cheap to resize it smaller, just a little time. But don't make it huge in case one day you want to cut a full sheet. The smaller it is the better tolerances and the faster you can cut. I will follow your recommendation and try to find here in Portugal 25mm steel tubes first. Congratulations for your awesome work . I´m getting some experience with OpenSCAD and I would like to try do model the MPCNC parts in OpenSCAD. The objective is to try to adapt to 28 mm tubes with an internal core for more rigidity at a nice price and easy buying, see: http://www.motedis.com/shop/Tube-systems-28mm/Profiles/Aluminium-Tubes-28/Circular-tube-with-core-aluminium-anodized-28mm::824.html. Maybe nema23 should be used because the tubes mass more than doubles. Do you see any inconvenience in using your work? After seeing the parts above are you thinking to adapt yourself the MPCNC to that type of tubes? If not, can you facilitate some blueprints or materials to make this task easier? I would look into steel tubes. I have not had a chance to test aluminum, I'm not sure How well it can hold up to the high point loads the bearings put on it. Before you try and replicate my design, you should find a more appropriate pipe. anyone else having problems with the pipe-fitting of the tower? the pipes which should fit in the tower parts cannot even pushed into it with force. none of them, at any direction/axis. disassemble the whole tower parts, and drill the bolt holes wider -> this is what i think could help. Loosen all the bolts with plastic on both sides. I call them the middle bolts, they have a large impact on tension. I'm guessing you put it all together, snugged the bolts, then tried to squeeze the pipe in there. You can actually back off all the bolts a little bit to allow them to move to the outer edge of the hole and you should be fine. my bolts do not have any room in the holes, even if i loose them... this could propably be the Problem. i think i have to drill them a little bit wider, i will start with the middle bearing bolts and try, if it does not help i do the same on the other side mounted bearing bolts. i will report back after im done. There are supposed to be tight in the hole. It might not seem like it but loosening them up really does help. It lets all the plastic flex a bit. This way in a week or two of use when things seat themselves you can give them all a little turn to snug it back up. The only person I know that really couldn't get them in actually printed the wrong version of a few of the middle parts. one of the vertical pipes, grinds on one of the bearings of the horizontal axe, meaning it blocks smooth movement. i tried to drill the hole to an elypse but this did not help, the bearing needs to be like 1mm more away fron the Z axis pipes. this problem does only hit ONE of the Z axis pipes, the other one is fine... ?? the bearing scratches the Z axis pipe, it cannot move, because the bearing reaches this pipe, which is not intended. i think it its because the black parts are not broad enough... if they would keep 1mm more distance between the orange parts, the problem would not exist. i think this canno be solved by drilling, the part needs a scale, redesign or some kind of spacer is needed. it also would be fixed, if the printing high of the orange parts would be at least 1mm taller, so they would have a bigger distance at their bearing in relation to the Z axis, there is no reason let it be so close the Z axis pipes. maybe my printer pressed the first few layers of the part to much down on the bed, so the high of this part was changed in the negative -> leading to this problem. i think i print it again on my second printer the check. you can see the left/inner bearing from the X/Y axis... this one scratches on the Z axis pipe. edit: the problem now is on both Z axis pipes... i forgot to tight the screws... the Z axis pipes are blocked be the bearings of the X/Y axis, the bearings reach to far in the direction of the Z axis pipes, so they scratch them hard enough to block movement. solution: the distance between the orange parts on my pics, needs to be greater... there is no need to be so close together. pls, make them just 2 mm higher or do this with the black parts, they are the spacing between the orange parts. Now im thinking of drilling the holes out with a 9mm bit but scared that the hole will be too big and that the side bearings of the middle end or joiner will start to rub on the sides of the parts as now there is just a mm of space in between. Have you maybe put the American parts in the IE package :) ? I'll have another look at it, it will take a little time. I hope this isn't the issue. I got called in early to work, so this is the best I can do until I get back home. The parts are different. The arrows show the hole offset (I will check the exact dimensions when I get home). The circle is how you can tell them apart. The IE version has a 3mm wall there and the other version has a 5mm wall. Please double check this and just double check your tube dimensions while your at it. The last time this happened the wrong parts were printed. With two of you having issues, I am starting to doubt my geometry... Need to get to the bottom of this. Or I need to get some 25mm tube myself and give it a try. measured out the pieces and it is 3 mm, so i did print out the right part. was playing around with the tubing and depending on how i turned it around it did flow better on some part then others, so i may just pas thru the hols with a file to eat up the sides a bit fo give it a better flow. But i did found that the nut trap fo the 25mm tubing is to big, it actually reflects the OD of the tubing and dose not fit inside :) I could cut off the ends or scale it down, but by how much. Did any body else refer to this issue? Do you have any more pictures of this up yet? No i haven't put up any new pictures. But my fubing nas 2mm thick wall hor how thick tubing did you design the nut lock? The nut lock doesn't need to fit well. It is just there to keep the nuts from spinning, or from having to use really long needle nose pliers. I am not sure how thick my tubing is, I am working for a few more hours. If you can tighten the tool holder you are using on the Z uprights the nut locks worked. You could just sand or cut off the edges. Something doesn't sound right about you tubes. Not fitting several pieces hasn't happened to anyone that i know of. I have a feeling your tubes are a bit off. Could you post a few pictures of them, with measurements. It all looks good. You have thick walled tubing so I would just sand those edges off to fit the nut traps. You can't scale them or they will not fit the nuts. There are a lot of international users out there and no one has had this hard of a time. feels like we are over looking something. your bearing OD is exactly 22mm? So that looks like an amazing fit! Mine do not roll by themselves. That is what you have been worried about this whole time? So these bearings will seat themselves a bit after some use. I'm more worried that you will not be able to get it tight enough later. The surface of these pipes is very inconsistent, they are not expensive polished rails. They will be a bit rough at first but smooth out very quickly. Once you get it up and running a few laps it will be much smoother. Finish it up and lets see some powered movement! Im also still at work will check it in about 2 to 3 hours time. I did firstly download the Us version but then made a separate folder for the IE and put all the IE parts in that, and also on a other PC downloaded just the IE parts so you got me doubting that i used the wrong file, but if i remember correctly i sliced the pieces on the PC with only the IE parts on it. After couple of unsuccessful prints from PLA (PLA version which I have doesn't work well with my full metal hotend) I am goint to print it in ABS. Hope that it will be precise enough. 2Allted : I have question according to sizes - recommended size like 30"x30" is working area size or total machine area ? And do you have some experience with asymmetric machines ? I want to do 40x80cm working space (RC modeler - balsa, plywood, foam, maybe just little of fiberglass and AL if possible but not necessary) and not sure which axis is better to have shorter (or it is don't matter) ? Also - is there some recommended solution how to support tubes on longer side (in the middle and bolt them to "ground" to make whole machine more rigid) ? 2All : Is somehwere "Z" axis tool holder for 25mm tube (I am going to do own spindle from 300W (for beginning) outrunner) ? I just had this issue at work. Not impressed with all metal hot ends, not a big fan of exotics either. We have a 3mm e3d at work and PLA didn't work with a .4mm nozzle, switched to a .6 and PLA is fine now. I think extrusion was so slow heat was creeping up the filament itself and hardening/friction in the cold section. Unless you already have ABS I would use PET it is way easier than ABS. 30x30 comes out to about 25x25. My machine is asymmetric, no big deal at all. Hard to explain but bed size means nothing, you just need to pay attention to part size. Not using end stops makes it much easier my slicer thinks my bed is 2Mx2M it doesn't matter. doesn't matter what axis is shorter at all. When you get to that point I can make a 25mm holder if there isn't already one out there. An outrunner spindle is cool, That was the original plan, but store but trim routers are cheaper and less work. So ABS is really useless or very problematic - even part with external dimension accurate enough have problem with inside stuff so conduit don't fit between bearing. So I have to solve PLA issue first - well, it is usable for other stuff to so not big deal, just surprised me that it makes such problems. I prepared small calibration block with two holes in it and one internal area so I can test sizes before I start real print. I've got about 25 hours of printing to go yet, just thinking ahead, I haven't seen much on how people are boxing up the electronics except for this http://www.thingiverse.com/thing:978319 and this http://www.thingiverse.com/thing:978384. Before I go and reinvent the wheel, did I miss something? I don't have any of mine covered yet....I really need to at least get a fan on my ramps. I would like to get one that I could mount close to the "action" without it getting dirty but I think that will be a bad Idea. Ianhobby2011 - I had never seen that one yet looks good. GeoDave and PCFlyer have made a few different ones I think. I am wondering if I would get the CNC mill running with Raspberry Pi 2 and LinuxCNC? 1) Is there a good source for the shielded 4 wire cables? 2) What length is for the threaded M8 rod recommended? Hi there no clue if that helps you, i run my Ramps based Prusa i3 via a Raspberry 2 with Octoprint as a web based printer Host (i Run Octopie on the RB2, its a moddes Raspioan OS with embedded Octroprint host). I have no experience with the raspberry pi as a cnc or printer. Ramps is much cheaper and more widely used. I looked into linuxcnc and it didn't fit my needs. The currently recommended software is cheap/free and easy. I need to be able to multitask while my cncs are running for hours on end and linux isn't an option for me at this point. 1- You can use home alarm cable, stranded, or cat5-6 cable. 2- 10-12" should be pretty good. Hello, I have finished the most printed cnc, but it gives me problems when the first tests . My problem is that when I load the file from the Estlcam to repetier -host begins to realize the cnc engraving takes 10 seconds but when it stops . And start making a completely different sent recorded . I deleted all the parentheses , but I think the Gcode damaged. Try KCop's test code found here. Did you follow this walk through? Any errors in repatier? Temp errors? You can send my your code through the contact me page on the website and I can look at it. Well found, I wasn't having any luck finding 25mm tube in the UK. Have you ordered it yet? I have not yet purchased, I am still searching for all the alternatives I would still like to find 25mm aluminium as a preference just because I think it will look better in the long run, but if I don't find anything else by the end of the week, I will order a sample to check that the measurement is in fact correct, I will let you know if it is. Thanks a lot for the information. Preston is actually quite close to me as well. I'd be interested in hearing how your build goes. It will be a couple of months before I start mine. i emailed the company and they confirmed 25mm steel, but as i was going to order a sample i found 25mmx3mm aluminium tube well priced, they have confirmed that it is in fact also 25mm on the nose here is a link to the new place i found http://www.simmal.co.uk/buy-aluminium-online/round-bar-tube/aluminium-round-tube-1-2-od-and-above, i am driving there tomorrow to buy, as they are in preston and that is close to me' i will let you yoy know when i get back. I think aluminium will be a better choice in the long run. Im trying to find 25mm OD pipe or tube in Australia and all I can find is 25.4mm OD. You can force this on but it is very hard to move. I have printed the parts in ABS. Have you heard anyone say what pipe/tube they are using in Australia. I can look into it after work if that doesn't answer it. Hi Allted that would be great if you can answer.. Its very appreciated. I am more than willing to ship some, the conduit is very cheap but I have no Idea what the shipping would cost. If you can wait until this weekend I can go get some and see if I can fit it all in one box. Max length would probably be just under 24", Maybe longer. This is something I wanted to start offering so I have been looking into it a little, all I know is it is not flat rate like my other shipments, but the shipping didn't seem to crazy domestically. If you can't get conduit in either 23.5mm of 25mm would be to see if your hardware store has closet hanger rod we have it in a bunch of sizes here. Try to get anything but the painted ones, that stuff seems great it just cost more than the conduit. If you can't find that, you should be able to get aluminum extrusion, you can get either round or hexagon. usually you can even get this cut to size, for a little extra. What material is recommended for the conduit? Aluminum? Steel? Steel or whatever you can get. Around my parts its galvanized steel. Most local hardware stores only got 25mm aluminum tube. But Bearings on aluminum didn't sound like a good idea to me. I'm sure the aluminum would be fine. If its as cheap as it is here, just go for it and let us know if it deforms. I think it will be fine. But in the netherlands most hardware stores indeed sell aluminium conduit 25mm. might atleast be a european standard for construction pipe. Contruction pipe is available in both steel and aluminium. And the maximum lenght of a construction tube is 6 meters.... that leaves some room for imagination. I decided to don't buy the conduit at my local hardware store. The prices online are way better. I can get stainless steel in 25x2mm for the price I would get aluminum conduit from my hardware store. They also sell on ebay, but it's cheaper to buy directly from their online store. Cheapest price for stainless steel conduit i've found. What would be "ideal" dimensions for an average setup? @Spiernik: Thanks for the link. What dimensions did you choose? @Allted: It is correct to assume that ALL conduits have the same dimension? Just double check your local conduit size before you start to print. Ideal depends on what you plan on doing with it. That's the beauty of it. Small for aluminum, big for foam, Medium for wood. Ideal really is probably start small 24x24 or 30x30 and see if you need to go bigger or smaller. It really isn't that big of a deal to change sizes once. I choose 800mmx800mmx400mm Which gives you a working area of arround 500x500x200mm. How thick did you take the tube? This is great for the price, a little on the big side, but a lot of power. Make sure this has a soft start feature or hook it up to something like the speed control I'm using so you can start it a little slower. Some of these just start at full speed/torque and really twist when they get started. That could cause issues after a few dozen times. The Makita would be ok ... Here it costs like 250 USD. There must be other solutions here? The raw spindle motor would be another option. But I would prefer a machine similar to the DeWalt or Makita?